Want to find us? 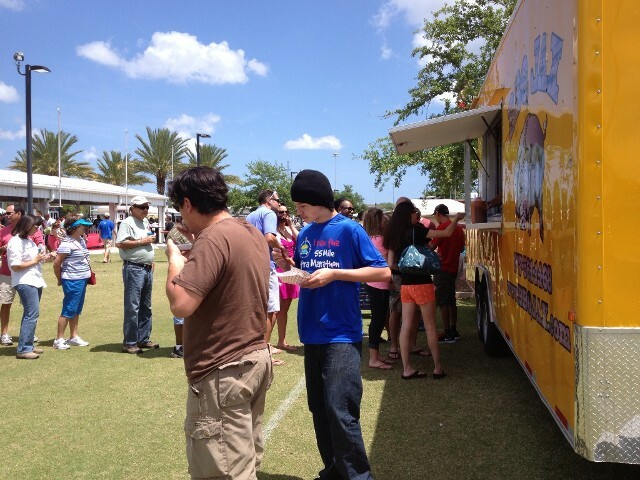 Download the free app Food Truck Finder USA. If we are out you can get GPS directions to our location. For a change from normal catering, grill up something new with BBQ JAX. Mobile BBQ catering from our Jacksonville, Florida, company adds more down-home flavor to your special occasion. Our new mobile BBQ kitchen prepares everything on-site, allowing us to serve you and your guests with fresh, hot, and mouthwatering BBQ that any BBQ competition judge would love! Hire us today to see how our BBQ pork, chicken, and beef, as well as our more than 20 years of combined experience, can liven up your occasion. If you're not throwing a party, you can still enjoy our BBQ chicken and other meats. Simply stop by our roadside kitchen to sink your teeth into our flavorful food. BBQ is more than just food for us—it's a way of life. We enjoy putting meat on the grill and then serving it up for others. Our BBQ is so good, you won't believe that we didn't start in the industry until 2011. After learning all we could about BBQ, we started entering our meat in competitions. The first one we entered was a success as we took "Grand Champion." Email us today or call (877) 561-1468 for BBQ beef, pork, and chicken you can't get enough of.